I love the idea of bringing a green salad to work for lunch. It’s light and healthy. You can add pretty much any ingredient to lettuce and call it a salad. Endless, delicious variety. However, it’s time consuming. There’s all that chopping. For a truly fresh and crisp salad, you can’t prepare it on Sunday for the Wednesday lunch hour. And then there’s the dressing. Dressing the salad too early turns your beautiful lettuce into slimy compost. Unless you’re one of those industrious people who has tiny Tupperware (I’m not), you end up having to lug around the whole bottle. So how do you prepare a salad on the weekend, keep it fresh throughout the week, and solve the cumbersome dressing issue? Make a high-protein salad, mix with a light healthy, homemade dressing, and add lettuce later. 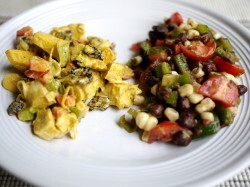 Curry Chicken Salad and Black Bean Salad both stay fresh in the fridge for several days. They can be prepared in under an hour. They’re filling served with greens, and additional dressing is not necessary. Chicken Curry Salad makes a great sandwich filling, and Black Bean Salad makes a great high-protein salsa, served with tortilla chips. Multi-purpose salads. Endless, delicious variety. Previous post: Blue Palate Site Hack!